Industrial production fell 2.0 percent in December, and declines were again widespread. Output was revised up in October, but it was revised down in November; for the fourth quarter as a whole, total industrial production decreased 11.5 percent at an annual rate. At 103.6 percent of its 2002 average, output in December was 7.8 percent below its year-earlier level. In December, manufacturing production dropped 2.3 percent. The output of mines moved down 1.6 percent, and the output of electric and gas utilities was little changed. Capacity utilization for total industry fell to 73.6 percent in December, a level 7.4 percentage points below its average level from 1972 to 2007. That chart is what economists call cliff diving, meaning the number is just falling head over heels into lower territory. This is also a very important number from a future GDP perspective. Remember that total private domestic investment is a component of GDP growth. This chart tells us that part of net private investment will not be moving higher anytime soon. Intel declined to predict future sales in an uncertain economic environment on Thursday and warned of rapidly deteriorating margins as its production lines ran on reduced capacity. The world’s biggest chipmaker kicked off what seems certain to be a grim earnings season for technology companies by reporting a 90 per cent fall in profits and a drop in revenues it said was unprecedented in the past 20 years. Intel said fourth-quarter profits were $234m, down from $2.3bn a year earlier. Revenues of $2.8bn were in line with a second warning on the quarter it delivered last week but were 19 per cent lower than third-quarter sales. “This is only the second time in 20 years that our fourth-quarter revenues were below the third quarter, the last being the year 2000 when revenues declined less than 1 per cent,” Paul Otellini, chief executive, told an analyst conference call. “The pace of the revenue decline in the quarter was dramatic and resulted from reduced demand and inventory contraction across the supply chain,” Mr Otellini said. He said Intel was assuming inventory reductions in the current quarter. Intel declined to predict future sales in an uncertain economic environment. Translation: we have absolutely no idea what the hell is going to happen. But it's probably not good. If things were good we would be telling you repeatedly to get people to buy our stock. .....warned of rapidly deteriorating margins as its production lines ran on reduced capacity. Translation: we've got some big problems. As a big company we rely on out ability to scale our costs. But when orders dip below level x we've got problems. And orders are below that magic level, so we've got problems. .....and a drop in revenues it said was unprecedented in the past 20 years. Translation: we've never seen it this bad before. As a result, we're probably going to become extremely cautious over the next two quarters. That means lack of capital investment, lack or hiring ... you get the idea. And if we're doing that, you can bet our competition is as well. “The pace of the revenue decline in the quarter was dramatic and resulted from reduced demand and inventory contraction across the supply chain,” Translation: the economy is falling off a cliff right now. Let's review where we are. According to the latest Beige Book things are pretty grim. This information is confirmed by the latest FOMC Minutes release. That means we are in a situation where we should do something. The proper question then becomes, what? On one side, the Federal Reserve has been doing everything it can (and then some) to keep the financial sector afloat. The Fed has expanded its balance sheet enormously to deal with the financial crisis. Whether or not you agree with that expansion is a different question than whether or not it has been effective. The answer to the latter is yes -- credit spreads have come down. Lending won't return to pre-recession levels for awhile because, well, we're in a recession when lending naturally slows down anyway. The main goal is to increase consumer demand through government spending. The logic goes like this: the government spends more money. In spending this money they hire people to do things either directly (by directly hiring them) or indirectly (by having government contracts go to private firms who then hire people etc...). This puts more money in people's pockets which they in turn go out and spend. The big question is will it work? The basic GDP equation (consumer spending + investment + exports + government spending = GDP) says so. But it's important to remember that the best laid plans of mice and men can run afoul too. In other words -- this is not a guarantee and should not be sold as such. There are still a ton of risks involved with this move. Notice there is technical support right around the 84 level. Prices moved through that level today, but bounced back. Also note the increasing volume since the end of December -- the volume was increasing as prices moved lower. 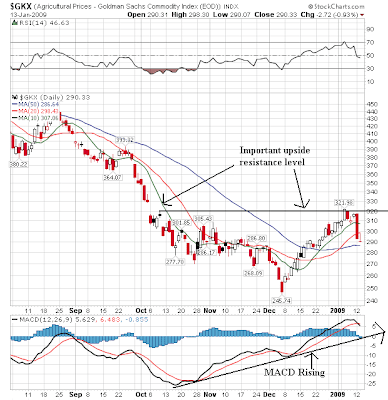 Also note there is technical support at/around the 82 level. Prices dropped hard in the morning, then rallied into the 20 minute SMA. Prices moved to the 81 level and then rallied hard. Note the increased volume on the rally. Prices moved just above the 200 minute SMA and then retreated, but rallied again into the 200 day SMA. This is what a reversal looks like. Note the intra-day turnaround, the increasing volume on the rally and then the close on higher volume. That's a big move. Bernanke made a speech on Tuesday to the London School of Economics. The opening line is especially important. However, although the subprime debacle triggered the crisis, the developments in the U.S. mortgage market were only one aspect of a much larger and more encompassing credit boom whose impact transcended the mortgage market to affect many other forms of credit. Aspects of this broader credit boom included widespread declines in underwriting standards, breakdowns in lending oversight by investors and rating agencies, increased reliance on complex and opaque credit instruments that proved fragile under stress, and unusually low compensation for risk-taking. This is an incredibly important point that needs further discussion. Above is a chart or real (inflation adjusted) median household income from the Census Bureau. Note that during this expansion income dropped and then increased but is not higher now than at the start of this expansion. Also note that while there has been an increase over the last 30 years, the increase is (roughly) $8000. In other word, it's not that big an increase. 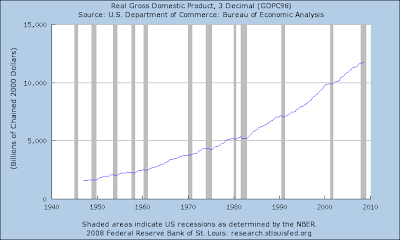 Notice that real (inflation adjusted) GDP more than doubled for the years 1980 onward. That leans an interesting question: where did the money for consumer purchases come from to expand GDP? 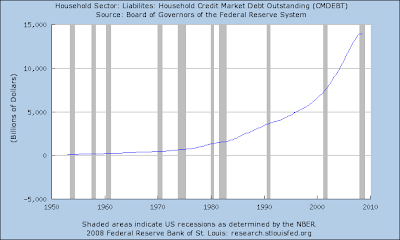 Household debt. The bottom line is people are spending money they don't own. But at the same time, it's understandable. While their family income isn't increasing with the nation's product, people in general want more stuff. So they borrow money to get it. What we're going through right now is the great unwinding of the giant, 30 year debt acquisition binge we've been going through for the last 30 years. And it isn't pretty. District reports indicate that retail sales were generally weak, particularly during the holiday season. A majority of Districts noted deep discounting during the holiday sales season. Vehicle sales were also weak or down overall in the Districts reporting on them. Manufacturing activity decreased in most Districts. Declines were noted in a wide range of manufacturing industries, with a few exceptions. Services sector activity generally declined across the Districts, with exceptions in some sectors of the Boston, Richmond, and Chicago Districts. Additionally, several Districts noted weaker conditions in transportation services and slow or decreased demand in tourism activity. Conditions in residential real estate markets continued to worsen in most Districts. Reduced home sales, lower prices, or decreases in construction activity were noted in many Districts. Commercial real estate markets deteriorated in most Districts, with weakening construction noted in several Districts. Overall lending activity declined in several Districts, with tight or tightening lending conditions reported in most Districts. Credit quality remained a concern in several Districts. Agricultural conditions were mixed in response to varying weather conditions across the Districts. Mining and energy production activity generally declined since the previous report. Read the whole report -- but only if you have a strong stomach. More than 2.3 million American homeowners faced foreclosure proceedings last year, an 81% increase from 2007, with the worst yet to come as consumers grapple with layoffs, shrinking investment portfolios and falling home prices. Moody's Economy.com, a research firm, predicts the number of homes lost to foreclosure is likely to rise by another 18% this year before tapering off slightly through 2011. The bottom line is the economy is creating a ton of stress, which is leading to this problem. And the real problem is underwater mortgages -- mortgages that are worth more than the house. 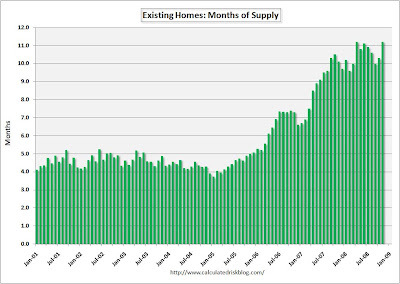 So long as that problem persists the housing market will be in trouble. 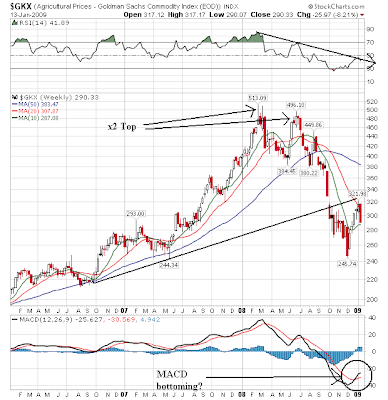 Bottom line: The weekly chart says this market is done selling and maybe wants to rally. The daily chart says maybe. Oil and gas stocks are increasing -- and oil stocks are at the top of a historical range. 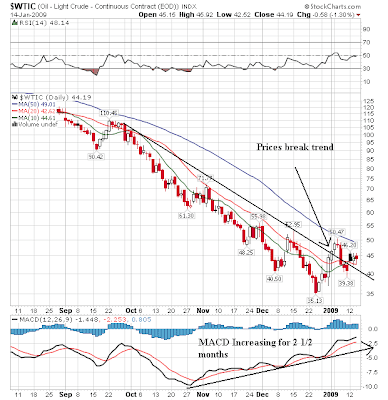 This indicates there is less demand for oil from the market right now. 1.) 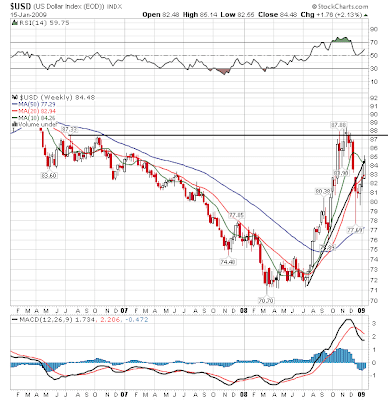 Note that 92 (line 1) provided incredibly strong resistance to an upside move. As prices moved higher, the average volume also increased. Granted this was weaker volume because of end of the year trading, but an increase in volume should not be overlooked. But -- prices fell. 4.) 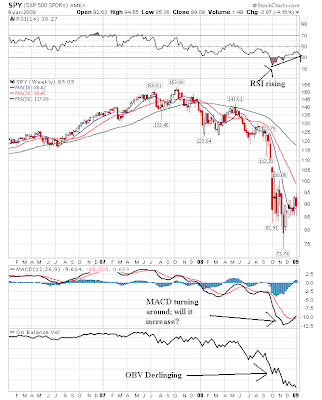 The only good thing about this chart is the SMAs are bunched together in a tight range. Nortel Networks Corp., North America’s biggest maker of telephone equipment, filed for bankruptcy protection in the U.S., a victim of the global credit crunch and declining sales. Nortel, based in Toronto, had more than $1 billion in assets and debt, according to a Chapter 11 filing of its U.S. subsidiary today in Wilmington, Delaware. Fourteen affiliates of Nortel’s financing unit are seeking similar protection in Delaware. Five units filed for bankruptcy there under Chapter 15. Nortel said Canadian affiliates also will seek protection. Sales at U.S. retailers fell more than twice as much as forecast in December as job losses and the choking-off of credit led Americans to cut back on everything from eating out to car purchases. The 2.7 percent decrease, the sixth consecutive drop, extended the longest string of declines in records going back to 1992, the Commerce Department said today in Washington. Purchases excluding automobiles slumped 3.1 percent. Today’s figures indicate that the hit to spending in the recession is even deeper than estimated, and spurred a slide in stock-index futures. The loss of 2.6 million jobs and declining home and stock values are squeezing households, hurting retailers from Wal-Mart Stores Inc. to Tiffany & Co., which today said its holiday sales fell 21 percent and cut its earnings forecast. Sales fell 0.1 percent for all of 2008 compared with the prior year, the first decrease in the Commerce Department’s records. 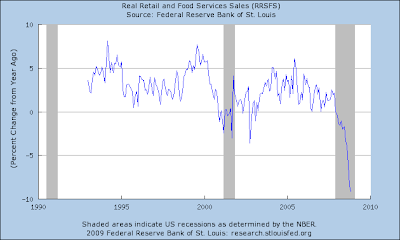 Comparable data only go back to 1992 because government economists reformulated their retail-sales figures earlier this decade, and didn’t revise historical records beyond that year. November’s decline was revised to 2.1 percent from a previously estimated fall of 1.8 percent. Today’s report showed declines in 11 of the 13 major categories tracked by the government, led by a 16 percent plunge at gasoline service stations that partly reflected the slump in fuel costs. The drop at grocery stores was the biggest since April 2002 and the decrease at restaurants was the largest since the terrorist attacks in September 2001. Note some of the data points: the loss is twice as much as estimated ... this is the first year over year loss since 1992 when the Census Bureau started keeping records ... November's decline was revised lower ... this is the longest streak of declines .... etc.. There is not once piece of good news in the release. 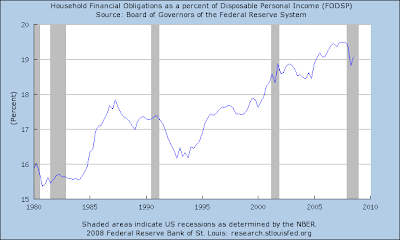 The percent of FDIC insured institutions that were unprofitable was at its highest level in the third quarter. The industry reported year-over-year growth in net charge-offs for the seventh consecutive quarter. Net charge-offs totaled $27.9 billion in the quarter, an increase of $17.0 billion (156.4 percent) from a year earlier. Two-thirds of the increase in charge-offs consisted of loans secured by real estate. Charge-offs of closed-end first and second lien mortgage loans were $4.6 billion (423 percent) higher than in the third quarter of 2007, while charged-off real estate construction and development (C&D) loans were up by $3.9 billion (744 percent). Charge-offs of home equity lines of credit were $2.1 billion (306 percent) higher. Charge-offs of loans to commercial and industrial (C&I) borrowers increased by $2.3 billion (139 percent), credit card loan charge-offs rose by $1.5 billion (37.4 percent), and charge-offs of other loans to individuals were $1.7 billion (76.4 percent) higher. The quarterly net charge-off rate in the third quarter was 1.42 percent, up from 1.32 percent in the second quarter and 0.57 percent in the third quarter of 2007. This is the highest quarterly net charge-off rate for the industry since 1991. The failure of Washington Mutual on September 25 meant that a significant amount of charge-off activity was not reflected in the reported industry totals for the quarter. I am a member of a Facebook group called Speaking of Taxes. I gave a presentation to the group last week. Here is a link. It lasts about half an hour. Prices are really high relative to the last 5 years. Let's take a closer look at the three month chart. There is a bid in the Treasury market caused by concerns about stock earnings. Considering we're at the beginning of earnings season and that earnings season is probably going to be pretty bad I would think this bid will be in the market going forward for a bit. Actually, it's yesterday's market. And this is important so I'm going to keep this up and run the Treasury market charts in a few hours. Some very important technical developments occurred yesterday. 1.) Since the end of November, the SPYs have been in an upward sloping trend channel. Yesterday prices fell through the lower support line of that channel. 2.) 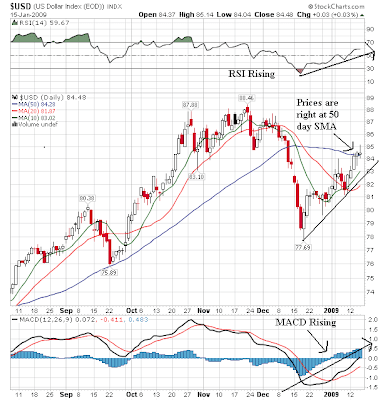 Starting in early October, there was a downward sloping trend line that acted like the top of a triangle consolidation pattern. Prices broke through this trend line a little over a week ago. Prices broke back through this line yesterday. 4.) Prices have fallen through all the SMAs over the last few trading days. It looks as though prices want to test the lower 80s levels again. 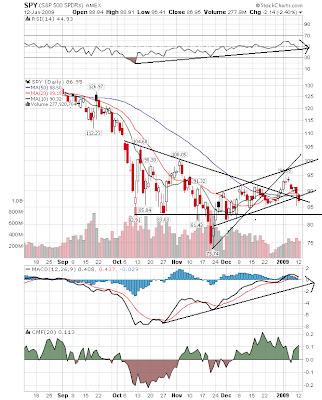 Considering Alcoa's announcement yesterday to kick off the earnings season along with the announcement that banks will announce their first quarterly loss since 1990 a retesting of lows makes sense right now. I am flying back to Houston today, so when the market closes I will be 30,000 feet above the ground. I will post this in the morning. See you then. A marked contraction in the U.S. economy in calendar year 2009, with real (inflation-adjusted) gross domestic product (GDP) falling by 2.2 percent, a steep decline from a historical perspective. A slow recovery in 2010, with real GDP growing by only 1.5 percent. An unemployment rate that will exceed 9 percent early in 2010; the unemployment rate has been that high only twice in the past 50 years (in 1975, for one month, and in 1982-1983). A continued decline in inflation, both because energy prices have been falling and because inflation excluding energy and food prices—the core rate—tends to ease during and immediately after a recession; for 2009, CBO anticipates that inflation, as measured by the consumer price index for all urban consumers (CPI-U), will be only 0.1 percent. A drop in the national average price of a home, as measured by the Federal Housing Finance Agency’s purchase-only index, of an additional 14 percent between the third quarter of 2008 and the second quarter of 2010; the imbalance between the supply of and demand for housing persists, as reflected in unusually high vacancy rates and a low volume of housing starts. A decrease of more than 1 percent in real consumption in 2009, followed by moderate growth in 2010; the rise in unemployment, the loss of wealth, and tight consumer credit will continue to restrain consumption— although lower commodity prices will ease those effects somewhat. A financial system that remains strained, although some credit markets have started to improve; it is too early to determine whether the government’s actions to date have been sufficient to put the system on a path to recovery. In other words, this is without a stimulus plan, FYI. If there is no plan, then I agree with this scenario. I should also add the following important caveat: there is no guarantee the fiscal plan will work as advertised, planned or desired. It's simply the best shot we have right now at solving the problem. Mario Gabelli: In 15 days we will have a new leader who is going to re-brand America. His first priority as CEO of the country is to create jobs and insure that no adult is left behind in this economic system. ..... The missing element is confidence. New tax laws are going to help with that. 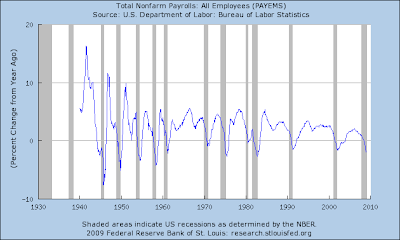 The working person is going to get a financial stimulus, and even under the most bearish scenarios 91% of those who can will be working in December 2009. You're going to see an investment-tax credit and a change in depreciation, encouraging small businesses to make capital investments. On Sept. 15 somebody shut off the lights for the business person. It has been hell since. We need to go from this hell for businesses to a kind of purgatory. More spending on investments and the possibility of a lower tax rate for corporations would send an interesting message to the business world. This really hits the new administration's top priority on the head: right now there is no confidence in much of anything. 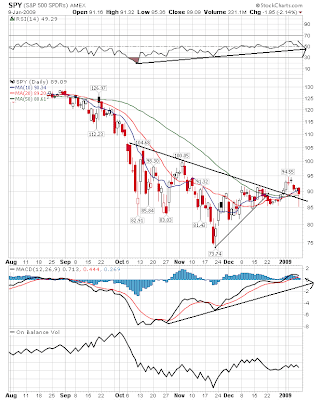 This situation started in the credit markets and has now spread to the economy as a whole. I personally think it was a primary reason why McCain lost the election: people were simply sick of the way things were and wanted something different. Now the new administration has to deliver. Assuming they start to make good on their promises the consumer could start feeling better. Personally, I still think we'll see a weak first half followed by a fair second-half. But that assumes that Washington gets on track and actually does something positive. Without that, we've got serious problems. The whole process of deleveraging is deflationary. It will last several years. Where most economists will probably err is in how the corporate and household sectors react to this. They probably have built into their models expectations that private households and corporations react to fiscal stimulus as they always did. That is wrong. In previous deep recessions the household sector lost about 5% of its net worth. This time around, it has lost about 20%. Households will become much more cautious for years. Instead of spending, they will save. This was a consistent sentiment. The US consumer will now start saving more and spending less. Part of this is the result of deleveraging -- US Households have a ton of debt on their books and the current recession is forcing them to look at that in more depth. The decrease in spending will have profound ramifications for years to come. 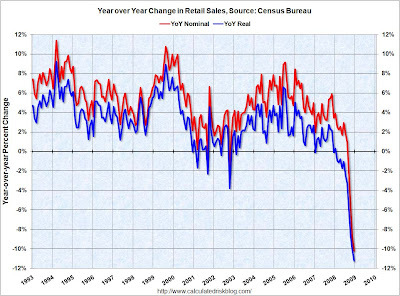 US growth is predicated on consumer spending. 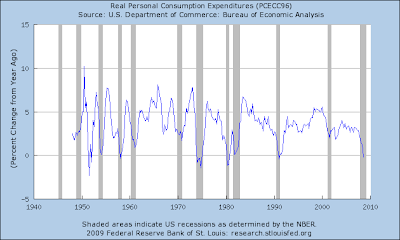 A drop in spending therefore implies lower growth unless something else picks up the pace. Zulauf: There will be changes in the corporate sector, too. S&P earnings peaked at about $100 or so. This year they could slump to $20 or $40. The consensus estimates are way too optimistic. Much depends on whether the problems in the real economy hit the financial industry, causing it to relapse. The behavior and thinking of corporate executives will change dramatically. Companies will repair their balance sheets instead of spending and expanding, and that's why the deleveraging process will take years and years and years. Government and central-bank stimulus won't have the multiplier effects we used to see. Economic growth will be much lower in the next five or six years. This is an interesting observation and it dovetails nicely into the previous statements about consumer spending. As consumers spend less through the deleveraging process corporations will make less money. As a result, their investment plans etc... will be negatively impacted. This is a good point. Valuations are cheap, and yields are good. 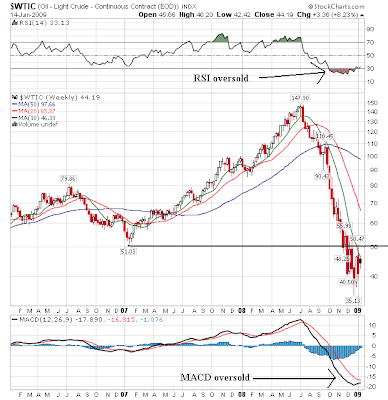 Over at the Big Picture Blog, Barry has noted that investor sentiment has been this low a few other times and the market rallied afterwords. But Ii should add that valuation is terrible timing method. Just because something is cheap today, don't think it will rise tomorrow. I agree with a lot of what Bill says. The economy is experiencing a rain delay. Nothing is going to happen for a while. Although the government's spending efforts will help, they won't be enough to cure the two biggest problems. The first is housing. 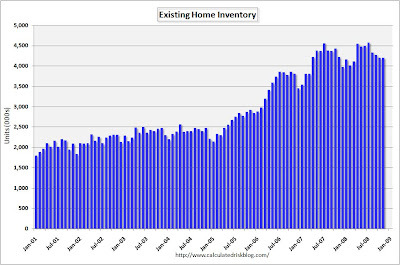 Unsold inventory of houses is more than a year's worth, and prices could go down another 10%-plus. 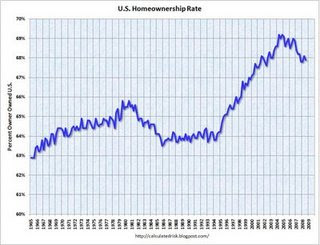 Mortgages have been reduced and prices are down, but 68% of the public still owns a home, versus 64%, the historical trend. The mortgage-equity withdrawals of recent years are over. Consumers spend 14% of their after-tax income on housing, more than they pay for food. No matter what the government does, it may not help housing, and in turn, the consumer. Additionally -- do people really need all of these houses on the market? 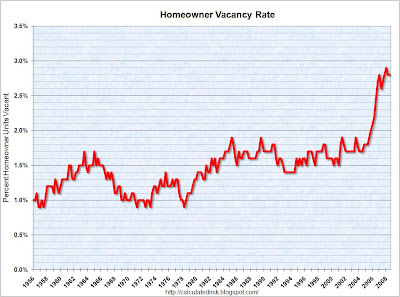 And the number of home vacancies is at multi-decade highs. 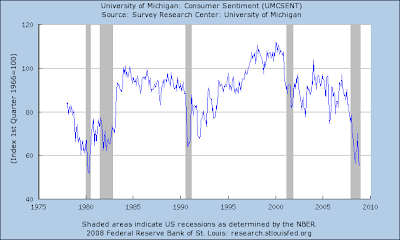 Households are heavily in debt (although they are decreasing that level lately). 5.) 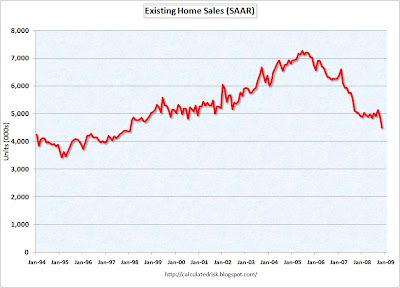 There is little reason to buy a home when consumer confidence is this low. As always, thanks to Calculated Risk for the great graphs. Notice the triple top break-out failed miserably. That is not a good sign for the future. 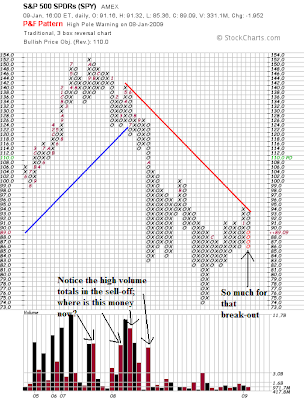 In addition, look at the lack of volume in the second half of the chart relative to the first half of the chart. There is just not a lot of excitement.